The distinctly rich and mellow flavour of KIKKOMAN Soy Sauce is the result of long months of unhurried natural brewing. This delicious all-round seasoning is essential to Japanese cuisine, but is just as much at home with dishes from Britain and beyond. KIKKOMAN Soy Sauce is completely natural, contains no artificial additives, and is made with just four ingredients—soy beans, wheat, salt, and water. KIKKOMAN is made distinct by its rich and punchy umami, the fifth taste, which enlivens and emboldens any dish, alongside the depth and flavour that adding KIKKOMAN Soy Sauce brings. To control the amount of salt in the dish, measure with a tablespoon; one tablespoon is equivalent to about a pinch of salt. Season the mince with black pepper then brown in batches in a hot pan and set aside. Fry the chorizo then add the onion, garlic, and green pepper and cook for a further 3-4 mins. Add the cumin, cinnamon, bay, chilli powder, and oregano. 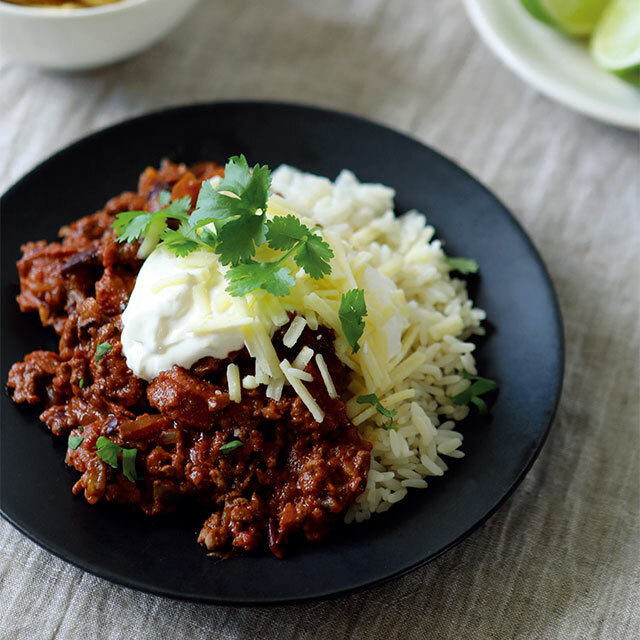 Cook for 1-2 mins, then return the browned mince to the pan along with the tomatoes, beans, puree, and stock. Cover with a lid and cook over a low-med heat for at least 1 hour; the longer the better. Towards the end of the cooking time, add soy sauce to season then add the sugar and grated chocolate. Serve with rice and garnish. KIKKOMAN Soy Sauce is the perfect base for a simple yet sensational salad dressing that will bring a hint of umami and complexity to any salad, while also working to enhance the flavours of the salad ingredients. Simply whisk together KIKKOMAN Soy Sauce, rice vinegar, and sesame oil at a ratio of 4:2:1 and drizzle over your favourite salad. 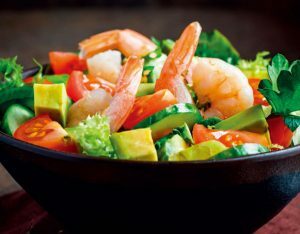 One great option is this delicious, healthy, and super-quick king prawn and avocado salad, made up from mixed salad leaves, peeled and sliced avocado, cherry tomatoes, cooked king prawns, and a scattering of freshly roasted sesame seeds. For a deliciously warm and sweet relish, heat 2 tbsp of oil in a pan, add 450g sliced onion and 2 chopped garlic cloves, and leave to cook, covered, for 20 min. Once soft, stir in 1 tsp cumin seeds, 75ml red wine vinegar, 4 tbsp brown sugar, and 2 tbsp KIKKOMAN Soy Sauce. Cook uncovered until the onions are caramelised and the liquid becomes syrupy, approx. 30 min. The relish can be kept in the fridge for up to 3 months. Add to a bacon and avocado sandwich, together with charred red pepper, crisp lettuce, and a smear of horseradish. 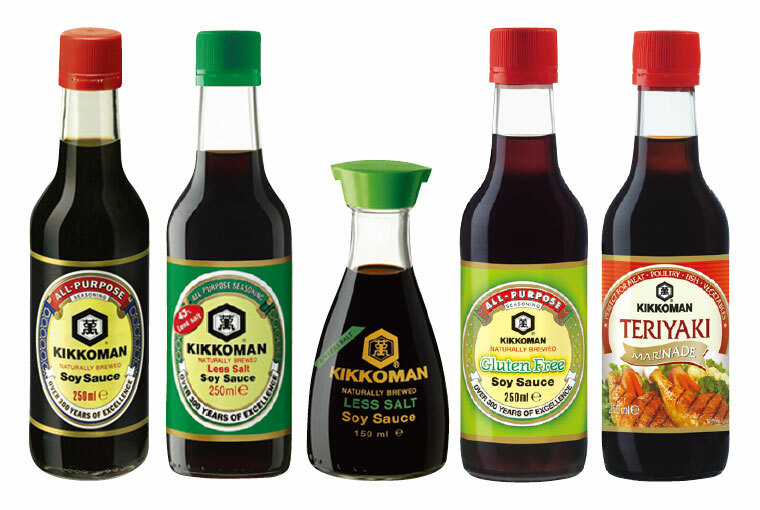 KIKKOMAN Regular Soy Sauce in a red-capped dispenser is the most common, but look out for the 250ml size, and the greencapped Less-salt Soy Sauce in dispenser and 250ml sizes. Tamari Gluten-free Soy Sauce is also available. Another KIKKOMAN favourite is Teriyaki Marinade, an all-in-one sauce for marinating chicken and salmon for BBQs and frying. Available at most major supermarkets or Japanese/Oriental grocery stores.